The 5 mile walk to support the Animal Humane Society is just two short days away! With your incredible support, we have already surpassed our Team Gus goal and our total so far is over $1100! Wow! Donations are still being accepted for this very much needed organization and in these tough times they really could use a boost as they support almost 40,000 animals. Any pledges, small or large, would be greatly appreciated! If you would like to support us, please check out our donation site! The banner above goes to the team site if you would like to pledge a team gift, while the donation link here goes to my personal support page - both go into the Team Gus pool! Lovely stalks of asparagus continue to flood into the market and we're definitely continuing to take advantage of the fresh springtime vegetable! We've been heavier on the meat consumption this week, so this Asparagus Risotto with Goat Cheese sounded like just the ticket to make as a veggie meal for dinner tonight! 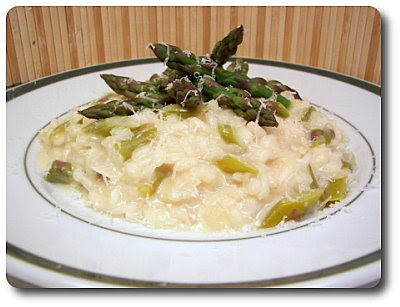 Before we began working our arm muscles out by stirring the rice round and round, this recipe had you prepare the asparagus in two ways so you experience them in different forms - deep inside the risotto and cleanly on top. First, we sliced a good section of the tips off from each spear and gave them a quick three minute dunk in the bubbling vegetable broth that will later be used to cook the rice. These are then set aside and will be used to set off the top of the creamy rice below it. The rest of the spears (minus the tough ends) are thinly sliced on the diagonal and added with the onion to begin the softening process. When the onions had softened, we stirred in the starchy grains of Arborio rice and pushed them around until they were coated in the residual oil and mixed in with the onions and asparagus. When the rice was hot and accepting of the liquids, we first added a healthy dose of white wine to give the grains a sharp edge. Next came interval ladles of vegetable broth, only being added once the broth before it had been absorbed. The time needed to cook and total amount of the broth needed will depend on how high of heat is used and how much liquid the grains accept before they start to turn mushy. For us, this took about 15 minutes or so once we began adding the broth. Sometimes you use all the broth called for, other times you have some left - we've even had times when we've needed add additional liquid because the rice still wasn't ready! Don't let that scare you away from trying risotto if you haven't yet - just keep testing a couple grains of rice here and there when it gets close to the time called for. The rice should be tender, yet still have a pleasant nibble in the middle that's firm - you also want to make sure you've added enough liquid that the mixture is still a little loose. Saying that, this isn't rice soup, so don't make it swim! When it hit that point, we took the skillet off the heat and stirred in nutty Parmesan cheese and a generous dose of soft goat cheese to melt in. 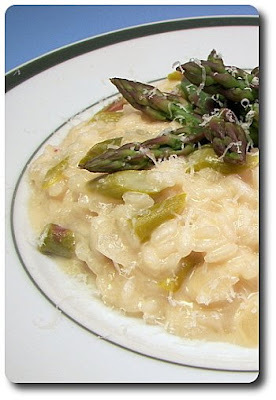 Once the risotto was placed on the plates, we arranged those crisp-tender green tips on top for a contrasting texture and pop of color, then added a bit more Parmesan on top as a finishing touch. I noticed right away that Jeff was picking at the tender slices of spears inside and told him "Just try it already!". He did and then the picking stopped - score! He was afraid they were going to be too mushy since they cooked in the risotto for quite a while (that darn texture thing! 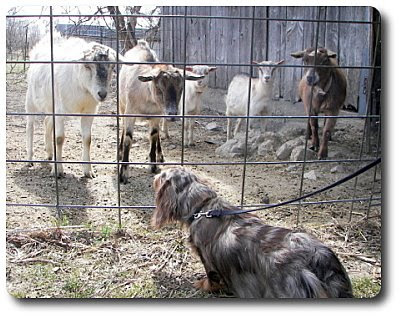 ), but he quickly found they still had enough oomph to them. I liked how the goat cheese brought an assertive tang, while also enhancing the creamy aspect already found in the dish. You could serve this as a swanky side dish if you cranked up the portions to six, but we opted to have it as a filling main and kept the size to four. After talking with Jeff while I was planning out the menu this weekend, we thought it would be nice to make a spring-y and bright type of recipe for the Weekly Wednesday Treat Day tomorrow. 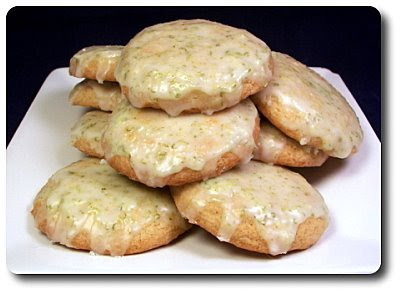 I went through my piles of cakes, cookies and bars to see what sounded good - we narrowed it down to a cake and a cookie, but these Glazed Lemon-Lime Cookies won out! The cookies were actually supposed to be just lemon, but we love this duo and we knew his coworkers would be game since those lemon-lime bars we made back in March were a hit. To force those two into the cookies, we beat both lemon and lime zest into the butter and sugar mixture before we got too far in. When we tossed the egg in, we also brought the juices from the zested citrus fruits into the mix, along with a splash of vanilla. The vanilla isn't there to make them taste like vanilla, but the extract acts to round out the sweet notes with a subtle floral essence. 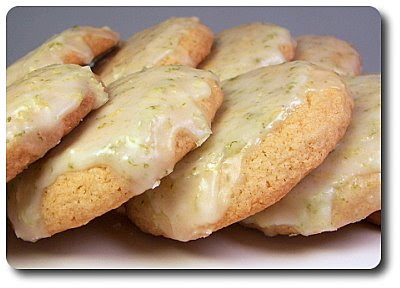 Being just a basic butter and sugar cookie, the lemon and lime play key roles to add a clean, zesty flavor that while good on their own, deserve a little support to up their intensity. 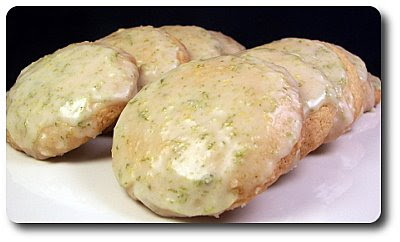 Rather than a heavier frosting, these cookies get a thin glaze that is studded with more of that fierce zest. Made simply by combining powdery confectioners' sugar with the two zests and enough of both fresh lemon and lime juice to thin it out. You could dip the tops of the cookies in or take a spoon and let the glaze gently flow over the top - to keep clean, set the adorned cookies onto a wire rack with either a sheet pan or the like underneath to catch any drippings that come off. I did find that the glaze was fairly loose, so I scooped up it up and spooned it over the cookies for a second time to give them a good, shiny coat. You may want to hold back on the juice when mixing it together and just add enough to get a consistency you like. The texture of the cookies crosses between being crispier around the outside edges, yet more soft and delicate as you reach their centers. While you don't get assaulted with a pungent, pucker-y punch, these cookies are just sweet enough and decidedly citrus in nature, which was like enjoying a warm spring sun shining down on my face as I let each bite slowly melt in my mouth. If lemon or lime (you could use just one or the other too!) doesn't conjure a thrill, how about switching the citrus zest and juice to orange and go in a different colorful direction? Since we've done chicken fingers and fish sticks before, how about we expand into some pork fingersticks? 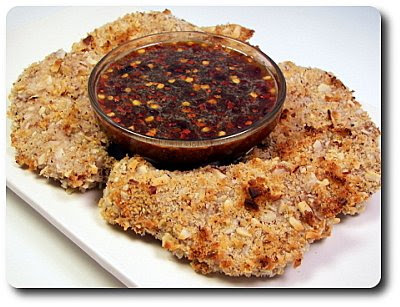 Okay, so maybe that isn't a word... we'll just leave it at Almond-Crusted Pork with Honey-Mustard Dipping Sauce instead. Before I got my hands messy slicing up the pork tenderloin, I made the mixture we were planning on coating it with in the food processor. To give these a leg up into having a crispier edge since they will be baked, not fried, we used coarse panko breadcrumbs as part of that coating. If you have access to those whole-wheat panko crumbs, you'll also gain a bit more in the golden color department! To give the coating a nuttiness and a bit more texture, we also tossed in a half cup of slender sliced almonds - seasoned simply with granulated garlic, salt and fresh ground black pepper, we whirled that mixture around the processor bowl just long enough to break up the nuts. When you go to slice the pork, try to keep consistent half inch pieces so they all cook at the same speed. Before we dragged them through the seasoned panko mix, we dipped the slices into a bath of beaten egg white so the coating would grab hold to the meat. To ensure the bottom of the pork doesn't turn soggy as it bakes, set the pieces onto a wire rack and then set the rack onto a baking sheet to catch any drippings. 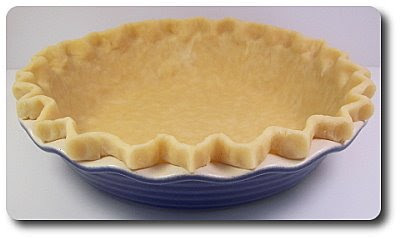 This way the heat can circulate around and crisp the bottom at the same time it does the top. I also like to set the breaded meat into the refrigerator for a short rest before they go into the oven - this also helps the coating adhere and dry out a tad. While we waited for them to bake, we whisked up a mischievous dipping sauce to serve with these. Besides being so simple and pantry-esque, what made this sauce so good was the fact it hit a lot of points on the tongue - salty, sweet, tangy and spicy. 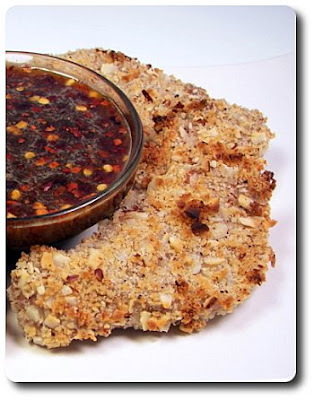 To accomplish this, the sauce is composed of sticky honey, soy sauce, Dijon mustard and those fiery crushed red pepper flakes. By the time you've cleaned up and made the sauce, the pork should be ready - it only took a short 12 minutes to cook through! Will the breading end up as shatteringly crisp like it would being deep fried? No, not exactly, but spraying the coated pork lightly with olive oil spray before baking does work well in adding to the crispness and you can relish in the thought of not adding a lot of fat! If you can't find regular or whole wheat panko, try making your own homemade whole-wheat breadcrumbs. Take a few slices of your favorite sturdy bread (crusts removed if you wish as they can end up being a little tough) and pulse them in the food processor until coarse crumbs - then scatter them onto a baking sheet and let them dry out in a 250 degree heated oven. You should get roughly 1/3 cup crumbs for every slice of bread used (depending on the size, of course). 7 new recipes came out of our kitchen this week! Trying to keep the list to three, I would have to chose the snazzy Egg and Bacon Bread, that decadent Chocolate Turtle Cheesecake and the refreshing Potato, Chicken and Fresh Pea Salad. While we've had all the ingredients in tonight's dinner before, we have never paired them together like this for such a speedy meal. 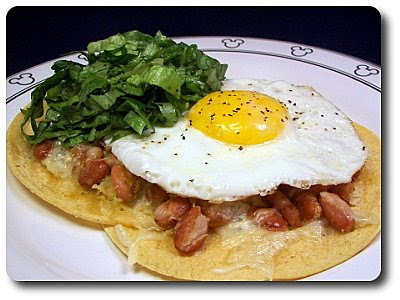 This Huevos Rancheros Verdes I prepared is a spin on a Mexican classic that uses green salsa instead of a tomato-based red sauce. I would like to think we have made solid headway in our trek to expand the types of recipes we try, but then we come across a dish like this which is probably fairly common for others and I am reminded we have a long way to go. That's what is so fantastic about the world of food - there are/is an impossible amount of directions you take food and still be surprised everyday with combinations that you thought you may never like or thought of! For a sturdy base to this "ranch eggs" dish, we coated corn tortillas with olive oil spray and proceeded to create a larger surface area to work with by overlapping two together. Before topping them off, we put each pair onto a large baking sheet, then spooned over a mixture of pinto beans that we tossed with tart salsa verde (fancy for tomatillo salsa!). 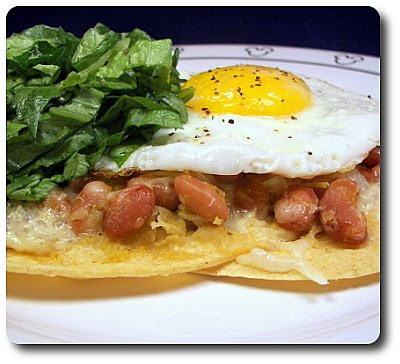 On top of that saucy combo, shreds of sharp white Cheddar were scattered over and the filled pairs were slid into the oven to heat the beans through, melt the cheese and crisp up the tortilla bottom. Those tortillas stayed in the oven long enough that we were able to crack four eggs into a large skillet and cook them to the point where the whites were set, yet the golden yolks were still soft and fluid. If you don't groove on oozing egg yolks, feel free to add a couple more minutes to the cooking time, which will harden them up. I heard the timer ding that the tortillas were done just a minute after the eggs were ready. We scooted one egg on top of each pair of tortillas, then added a quick toss of crisp shredded romaine lettuce, a sliced scallion and fresh cilantro that we dressed with canola oil and lime juice for a clean contrast. As I said, we've never had the traditional version of this, so I can't say one way or another in regards to how close it stayed authentic, but what I do know is that we'll be having this again and I plan to seek out other versions to compare it to! Jeff did comment that he felt it was kind of awkward to eat and I can see where he is coming from - is this supposed to be a knife and fork meal or are you suppose to just pick it up and eat it? Ready in under thirty minutes, I think this recipe would be perfect to prepare for a passive weekend breakfast, but is still filling enough to serve at dinnertime. It also has the benefit of being pretty darn easy on the wallet too! The 35th annual 5 mile walk to support the Animal Humane Society that Jeff and I are participating and raising money for is just a week away! This organization takes care of almost 40,000 animals a year and very much needs any support it can get! As Team Gus, we have almost reached our goal of $1000... we are currently only $40 away from meeting that! I seriously can't say thank you enough to everyone who has generously donated in support of this outstanding organization. We are hoping to reach and maybe even surpass our goal, so any further donations, small or large, would be greatly appreciated! If you would like to support us, please check out our donation site! The banner above goes to the team site if you would like to pledge a team gift, while the donation link goes to my personal page. 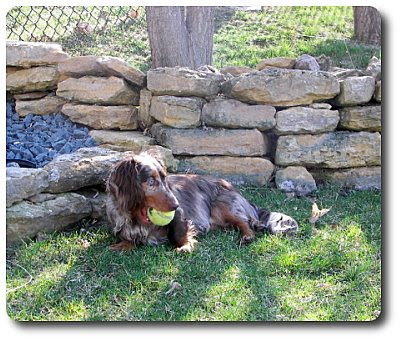 Gus decided that some ball play would be training enough yesterday - here he sits in the shade waiting for his turn to run after it! Last Saturday, I didn't get around to making us a sweet treat and I was itchin' to get one going this morning for us to snack on this weekend. I was originally thinking about a cookie, but when I was sifting through my sweet recipes-to-try pile, this Sticky Date and Coconut Cake caught my eye. I did have to make a quick run to the market for the dates, but everything else was handy in our pantry! Sticky in the title comes from how extremely moist this cake is - this comes from the technique used to incorporate the dates into the cake. The chopped dates are mixed with water, baking soda, a few pats of butter and a pinch of salt to keep the sweetness in check. Brought just to a boil, the mixture was removed from the heat and left to stand until the dates have softened and become very tender. We did sneak in a little more nutrition by adding soft whole-wheat pastry flour into the dry ingredients, but you could surely use all-purpose if you don't have that on hand. Once the batter was ready for the cake, we scooped the mixture into a springform pan to get ready to bake. Now, why not just use a regular cake pan you might ask? Since this cake is so moist and because of what happens next, using a springform pan makes a world of difference in trying to get the cake out in one piece once it is ready to serve. 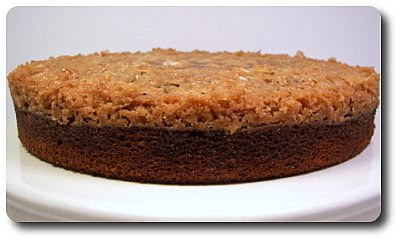 Even though the cake is not completely done, just over halfway through the baking time, the cake is removed from the oven and is doused in a boiling mixture of brown sugar, coconut flakes, butter and milk. 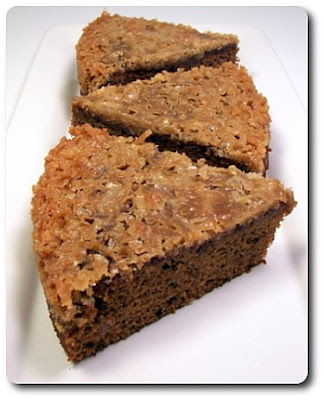 Slid back into the oven to finish baking, that mixture on top continues to bubble, creating a rich, crunchy and sweet contrasting topping to the softer cake underneath. Doneness is a little tough to tell with a toothpick since you have that mixture on top now, but you should be able to see if the batter is still raw or not - just make sure you don't confuse it with the sugary topping. When you pull the cake out, give it a five minute rest, then slide a very thin knife around the outside edge of the cake to release it from the side of the pan to finish cooling. This will help ensure the topping stays in tact and doesn't break when the cake shrinks slightly as it rests. Once cooled, you'll be able to release the sides of the springform pan with ease, making for a clean shot at cutting the cake into wedges. I already knew I liked dates, but I didn't know they could taste so good! 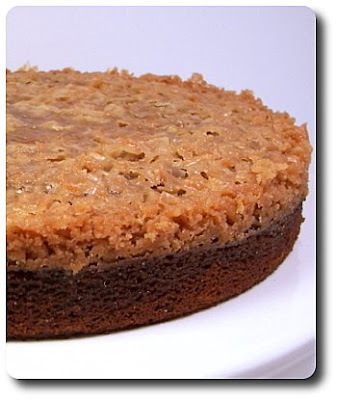 The toffee-like topping took this lighter cake over-the top and brought enough additional flavor that you don't even need to have any distracting spices in the cake. Even though the dates were fairly chunky to begin with, they integrated so well into the cake that they seemed to melt right in, leaving you with a uniquely sweet dessert that definitely quelled our snack attack! 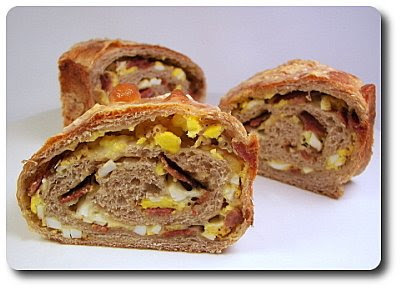 I don't know if you can technically call this Egg and Bacon Bread a pizza, but we did prepare it with our favorite whole-wheat pizza dough and I did make it tonight for our Friday Night Pizza! After I whipped up the pound version of the dough, I set it aside to rise, which gave me just enough time to get all the rest of the ingredients together. I got the eggs cooked and chopped, a mess of bacon crisped and shredded a generous hunk of sharp white cheddar. If you've never had luck hard-cooking eggs, the easiest way to do it is add the eggs into your pan, fill it with cold water and toss in a small scoop of salt. Bring the water just to a boil, cover the pan and take it off the heat for about 13 minutes. Once the timer beeps, drain the hot water away and shock the eggs with cold water. The salt is added to help with removing the shells when you're ready, but don't worry about it making your eggs salty... it doesn't go through the shell. I can't explain the science behind it, but it just seems to make the shells slip off much easier. Once the dough was ready to work with, I gently pulled it into a large rectangle and instead of using a tomato sauce as a topping, we smeared the dough with a medley of grainy mustard, a clove of garlic, black pepper, cayenne pepper sauce and a just a pinch of salt. 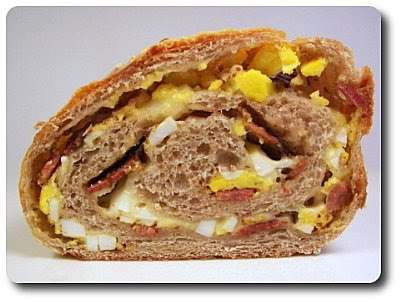 Next came the crumbled bacon and chopped eggs, followed by a good coating of the sharp cheese. The dough is then rolled up just like you were making cinnamon rolls, keeping it tight and even. While I'm sure this would be good baked as a long loaf as is, we curled the dough into a large tube pan to create an intriguing ring! Left to rise until puffy once more, before it went into the oven, we brushed the dough with an egg wash, added some slashes on top to allow for expansion and gave one more coat of that shredded cheese on top. Because of the layers, it will take quite a bit longer to bake - it is done when the loaf is a rich golden brown and pulls away from the sides of the pan. Because the cheese it melted and quite hot on the inside, you'll want to let this rest for about a half hour before you start taking out slices - this give the cheese enough time to set and not run out all over. Jeff wasn't around until I pulled it out from the oven and he was quite surprised! He could barely contain himself as we waited for it to cool down - once I took the first piece out and he saw the swirl of bacon, egg and cheese he was taken aback - "I had no idea this is what you where making! This looks so fun!" is all he could say. Using the mustard as a spread inside brought a charging zing and lent a nice bite to the salty bacon and eggs. While we had this for dinner, I think this would be a standout dish to serve at a casual brunch, on a buffet cut into small wedges or for a killer hearty breakfast! 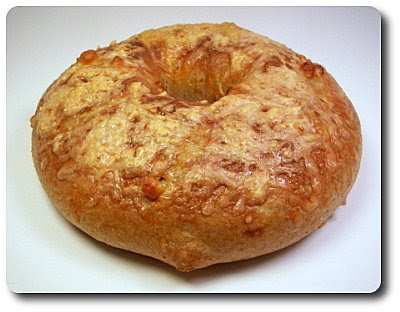 And since it is fairly contained and could be eaten out of hand, it could be a portable breakfast at that! Of all things lately, I don't think I ever expected to hear Jeff say "So, we haven't had broccoli in a while... how about we work that in this week?". I just gave a sly grin and replied "Really? Did the green vegetable police come and issue you an ultimatum?". Truly, I kid... and he isn't that picky anymore, but it just isn't that often he actually requests vegetables - I'm am very happy to oblige! I thought about just serving him a heaping plate of broccoli since he didn't ask for anything else to see what kind of reaction I would get, but I don't want to go and deter him from keeping this up! 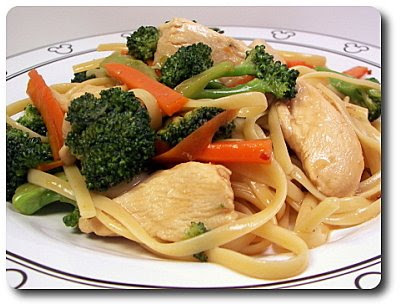 Instead, I ended up making this speedy Chicken Broccoli Stir-fry for us to have. For the chicken in this dish, you could use a pound of chicken tenders if you don't want to mess with cutting up the meat, but all we did was slice a few boneless and skinless chicken breasts into strips. Tenders are typically on the pricer side, but they would shave a few minutes off and save on clean up. We took those strips and tossed them into a fiery pan that had a slick of oil covering the bottom. Since they are fairly thin already, it didn't take more than a couple minutes for them to take on a light golden hue - once that happened, we whisked them out and set them on a plate before continuing on. After adding a bit more oil, we slipped three cloves of minced garlic and a couple teaspoons worth of fresh grated ginger into the pan and less than a minute later I felt their warm aromas tickle my nose. Broccoli florets and thin strips of carrot went into the mix and were left to mingle in the oil for a short time before the sauce was added. Broth, soy sauce, rice wine vinegar, crushed red pepper and a sprinkle of cornstarch made up that sauce. 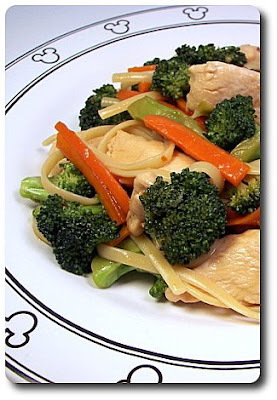 Once added in, along with the partially cooked chicken, we covered the skillet and left the sauce to bubble - this finished cooking the chicken through, allowed the vegetables to become crisp-tender and activated the cornstarch to thicken the sauce. This is quite saucy, which made it a perfect vehicle to serve with a pasta to bulk it up! We used regular linguine, but a nutty whole-wheat linguine would be a fine pairing with this. If pasta didn't sound good, serving this over a bed of nutty brown rice would be ideal to soak up that liberal sauce. The only change I think I would make to this would be to bump up the crushed red pepper to a full half teaspoon or so to give it a more rounded heat level. I was temped to up the garlic and ginger a bit, but they lingered through each bite enough that I'm glad I didn't fiddle with that. Hearty and a snap to make, Jeff got his fill of broccoli (I even caught him fishing into the leftovers for a couple more bites of the veggie!) and we both agreed we'd love to have this again. I must have had potatoes on the mind when I was getting recipes together for this week! 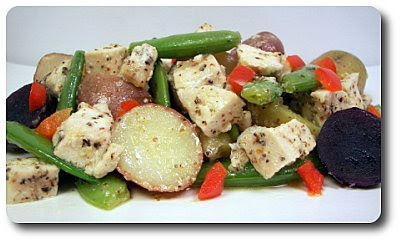 We used a few more so I could make this Potato, Chicken and Fresh Pea Salad for our dinner this evening. After slicing up a pound of potatoes to get them all roughly the same size and on the stove to cook through, I quickly trimmed a couple handfuls of fresh sugar snap peas. 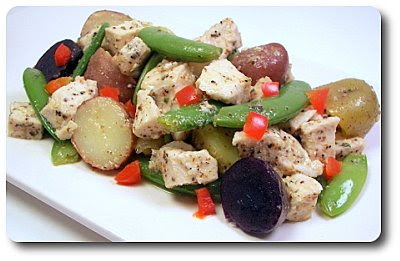 I used those same colorful baby potatoes that we used on last Friday's pizza, but just as with that, you could use those slender fingerling potatoes or small red potatoes. Just before the potatoes were done, we tossed the peas in to bounce around with them for just a quick two minutes to set their color and leave them crisp-tender. Once we drained away the water, we tossed those two with cooked chicken breast, tiny shards of red bell pepper and mild red onion. If the bite is still too strong for you using that raw red onion, try soaking the pieces in icy water for 10 to 20 minutes before using it. Jeff isn't the biggest fan, but he doesn't mind them when I do that. Before I started that, I would usually end up finding all of the little bits left on the plate when I went to wash them... he is good at zeroing in to pick out stuff he might not like! Unless I hide it well... hee hee - remember that dish filled with mushrooms? This is a salad after all, so we did toss it with a wickedly easy, but darn tasty dressing. In a bowl, we whisked together extra-virgin olive oil with an equal amount of white wine vinegar and added Dijon, fresh lemon juice, fresh tarragon and a minced clove of garlic. Bright, tangy and that hint of licorice-flavored tarragon brought such a delightful and fresh coating which made this salad feel quite light. The farmers markets still have a few weeks to go before they get going out here, but when they are in full force, I can see us making this pretty often by using their bounty of vegetables and a few pantry ingredients we always have on hand. What is great about this dish is the versatility of it - you could serve it warm right after everything is combined, let it sit around at room temperature if you're busy or even have it chilled for a refreshing lunch on a warm day! I had to make sure I picked up a bunch of cream cheese this weekend while we were at the market - I needed four packs to make the weekly Wednesday Treat Day item! Where was all that going? 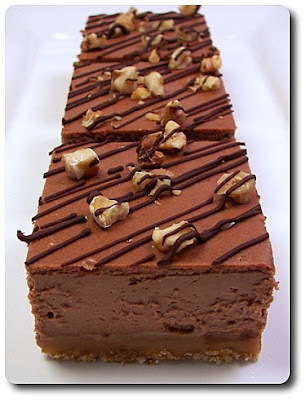 Into this Chocolate Turtle Cheesecake! Instead of using a round pan to cut the treats into wedges, this cheesecake is made in a big baking pan so we could get tidy squares out. To form the bottom crust, we crushed up a good amount of vanilla wafers and mixed the crumbles with chopped walnuts and enough melted butter to moisten. While turtle candies are usually made with pecans, I already had walnuts in the pantry and figured we might as well get them used up! To boost their presence, I did go ahead and toast them before tossing the nuts into the fury. To mix in the caramel aspect, the recipe called for simply melting caramel cubes with a splash or two of milk to smooth them out. This is then poured over the base, which will create a cryptic layer of sweetness inside. As is, I think this would made one tasty bar cookie! However, this is a cheesecake after all, so I needed to get going on making the batter! Nothing too unpredictable here - cream cheese, sugar, sour cream for tang and smoothness, along with a few eggs, a few dribbles from our bottle of vanilla and a lavish drizzle of melted bittersweet chocolate laced with espresso. I do have a few tips to make this batter smooth and dreamy - the cream cheese will beat up best if you let it soften at least a couple hours at room temperature before working with it. The eggs should also be taken out about 30 minutes before hand - if you forget, drop the whole eggs into a bowl of warm water for 15 minutes or so to take their chill off. You can beat the cream cheese and sugar well, but once you start adding the eggs, just mix them in until they have incorporated - you don't want to over-work it. The other reason you don't want to mix in together when the ingredients are chilled? When you add the melted chocolate in and if the batter is on the colder side, it may turn parts of the chocolate solid instead of staying fluid, which won't make for a smooth, cohesive chocolate batter! After placing the batter over the top of the caramel, the whole shebang goes into the oven to bake until the edges are set, yet the center still has a bit of a jiggle to it. As it cools, the center will finish cooking through and even if it happens to be a touch underdone (better under than over), it needs to rest in the refrigerator for at least a few hours, which will help firm it up. Good enough, yes? Not so fast! Before you dive in, the top is scattered with additional toasted walnuts and a drizzle of additional chocolate to finish this off. 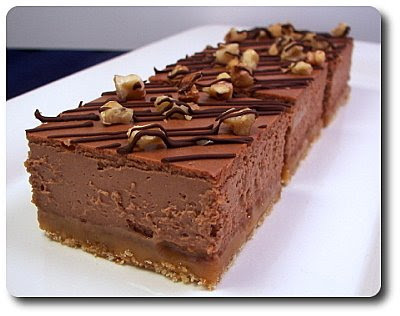 With a luxuriously creamy texture, I added just enough of that instant espresso powder to highlight the softer notes in the chocolate, yet not so much that it developed into a coffee cheesecake. If you did want that flavor to be more pronounced, I wonder if a couple capfuls of Kahlua would satisfy? The wafer crust, studded with walnuts, held together well and tasted divine, however I would have loved for it to be more substantial - I think I would make one and a half times the amount next time. Often we end up with leftover greens of various types that we don't know what to do with and while a salad would use them up, sometimes it just doesn't call to us. However, if that happens again, I'll have to keep this Potato and Greens Torta we made for dinner in mind. 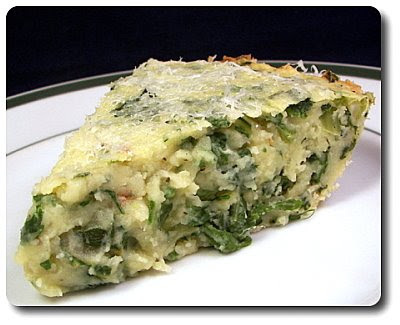 This torta is like a giant bowl of mashed potatoes, except made in pie form with lots of intriguing twists and turns! After looking over the recipe, it almost read to me like it was going to be a tad on the bland side, so I felt the urge to make some changes as I went along. Getting the potatoes prepared was first on the agenda - since we were using small Yukon golds, I didn't bother with peeling or cutting them up. After letting them simmer in salted water to become tender, we drained off the water and let them cool for a few minutes. While we typically don't discard the peels in our everyday mashed potatoes, the recipe called for using a potato ricer to get the fluffiest texture and this required removing their coating. Why not do this before hand? Well, after cooking them this way, the skins cleanly peel away without much effort... faster than using a utensil to do it anyway! While the potatoes were resting, I took a mixture of greens and tossed them into a skillet lined with olive oil that we infused with fresh garlic and crushed red pepper. Don't be afraid to play around with the greens if this sounds like something you might enjoy though! We added what the recipe called for... torn romaine, fresh spinach and arugula - I bet greens like Swiss? chard or kale would work well too. Once they had wilted, we took them out of the skillet and finely chopped so they would disperse well. Back to the potatoes! After I squished them through the potato ricer, I tossed in the wilted greens, a little milk to loosen things up, fontina cheese, Asiago cheese, a couple eggs to bind (which also lift up the heavy potatoes) and a few shakes from our jar of cayenne pepper sauce. You'll want to season this well with salt and fresh ground black pepper too - if you are afraid of adding too much, you could hold back on the eggs, mix in everything else and then taste for seasonings before going ahead with the eggs. Before scooping this into the pie plate, we coated it with cooking spray, then dusted it with breadcrumbs. While it isn't nearly enough to form a "crust", I did find it ended up helping get the pieces out in one fell swoop! 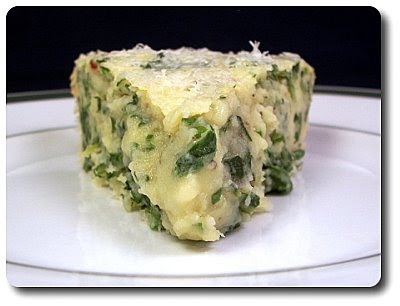 After baking this torta, the top is showered in Asiago, then set aside to let the potatoes firm up before serving. I'm glad I went ahead and fiddled with the ingredients (the Asiago inside, crushed red pepper, an additional garlic clove and shot of cayenne pepper sauce) as I thought it could have still used some help. Maybe adding extra sharp cheddar to the filling and tossing in a bit more arugula for bite? It was creamy as advertised though (go potato ricer!) and could be a great side or even main dish, if you are willing to work in a little extra zing! We finished out this past week with 8 new recipes. 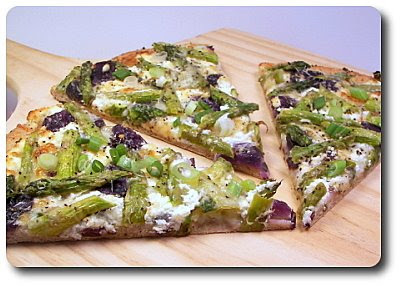 Looking back, I think we would have to choose the Asparagus, Potato and Goat Cheese Pizza, that sweet Maple Popcorn Caramel Crunch and the Asparagus, Leek and Gruyère Quiche as our favorites. This dish we made for dinner tonight, Cheesy Chicken Pasta, would be a great way to sneak in several healthy ingredients without anyone knowing how good it was for them! 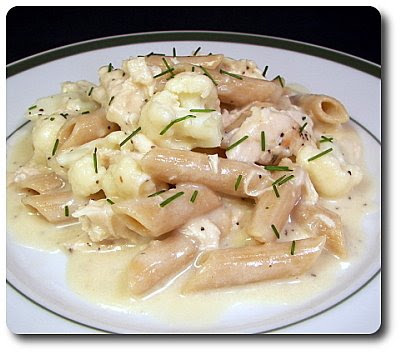 To start us off, we used whole-wheat penne that is filled with protein and fiber - if you haven't tried switching over to whole-wheat yet or you've tried it in the past and didn't like it, you might look into one of those multi-grain pastas (we've tried Barilla Plus in the past and have been pleased). They tend to be lighter in color and taste pretty darn close to regular pasta. When the penne was just short of being ready, we tossed a couple cups of small cauliflower florets into the same pot to save on dishes. While I was waiting for the pasta water to boil and for it to cook through, I also had another pot on the stove getting the creamy cheese sauce going. 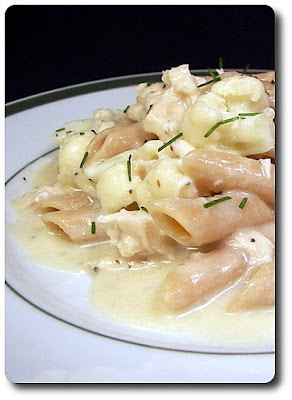 With a base of softened onions and a splash of white wine, the rest of the sauce is composed of milk and flour that were whisked in and allowed to thicken. You have a basic milk sauce right now, but what turns this into a cheesy coating is the addition of intensely flavored shreds of Gruyère cheese. Cooked chicken, that I first shredded, was plunked into the mix for a bit more protein, along with a dollop of Dijon for a bit of tang in the background. The sauce was then combined with the cooked pasta and crisp-tender bites of cauliflower, then topped off with a few fresh chives. Kind of like a stove-top mac-and-cheese, I almost thought that there was going to be too much of the sauce once everything was tossed together, but it didn't take us long to realize how tasty it was - and yes, we may even have to admit we licked our plates clean! The sauce was a tad on the thin side for me, but it was quite rich and did seem to cling well to the pasta, chicken and cauliflower. The nutty Gruyère made this for us, but I don't see a problem using a milder Swiss, which might satisfy a younger audience... that and it would probably be more friendly to the wallet! We are down to a short two weeks away before Jeff and I will be walking in the 35th annual 5 mile walk to support the Animal Humane Society in memory of Spike who we lost last year. 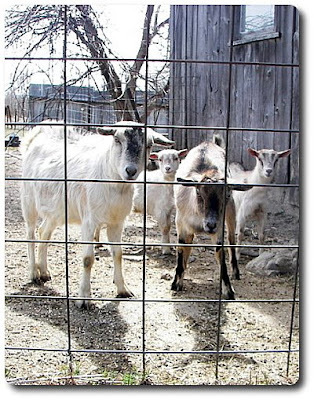 This is such a fantastic organization that takes care of almost 40,000 animals a year! I can't say thank you enough to all of you who have generously donated so far! As Team Gus, we have almost reached our goal of $1000... we are hoping to reach and maybe even surpass our goal, so any further donations, small or large, would be greatly appreciated! If you would like to support us, please check out our donation site! Jeff loves rye bread and while I have plenty of the flour in the pantry, its been awhile since I've made good use of it. I thought it would be nice to work that flavor into a dinner roll and I was especially intrigued when I spotted a recipe for these Rye Dinner Rolls with Crisp Tops. There isn't anything more much relaxing to me than getting lost in kneading a mound of dough - pushing, pulling and feeling the change on my fingers as it transforms from a rough shaggy mass of flour into a smooth dough. 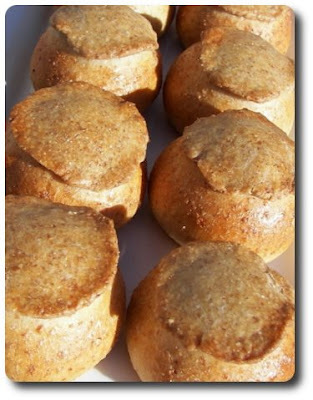 For these rolls, the dough is a combination of all-purpose flour for strength and just enough rye flour to work in its unique taste. Since I pretty much always rely on instant yeast, just as I call for here, I don't bother proofing it beforehand. However, if you are using active-dry and wish to do this, mix the yeast with about a quarter of the warm water called for, along with the sugar for the yeast to feed on. The dough should be supple and tacky when it is ready - if it ends up feeling too dry, you can work in extra water, but it does get a little messy that way. Once the dough had risen, we divided it into 16 equal portions and rolled each into a tight ball. A scale is good for this to ensure the balls are the same size, but if you don't have one, just divide the dough into quarters and then quarter each hunk. Now, as these rolls rise for a second time, the intriguing part finally comes in! While I'm sure these would be tasty as is, a fun flare is added by topping them off with a homemade rye cracker before going into the oven to bake! The cracker is simply prepared by combining all-purpose flour, rye flour, salt, water and a touch of olive oil. This mixture comes together in a snap and isn't kneaded like the above - just worked together enough to smooth it out. 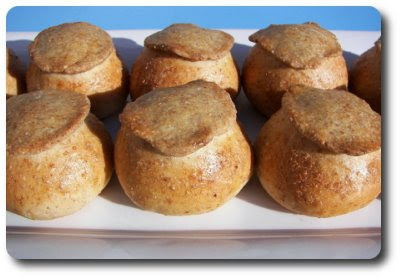 Divided into 16 pieces like the rolls, each piece of this dough is just flattened and rolled out into a thin round. Don't strive for perfection here, you want them thin and round, but not perfect like they've been stamped out - release your inner rustic being! Once you have a mess of the rounds done, each is brushed with a beaten egg white and left to dry while the rolls finish rising - the white stiffens them slightly so they don't fall flat on the roll. To attach the raw cracker to the roll, the dough balls are brushed with the leftover egg white and the rounds are laid on top. I thought that the cracker may end up getting too dark by the time the roll had cooked through, but they both took on a lovely golden hue. The cracker was crisp and while the roll had a crusty exterior, it still had a nice, soft texture on the inside. So, while that was good and all, they didn't have as much as a rye flavor to them as I hoped they would. I knew it was going to be iffy because there wasn't much rye flour used in the first place, but I was still hoping the rye would come through a bit more than it did. That doesn't mean that they were bad by any means, in fact, if I didn't know they were supposed to be a rye roll in the first place, I probably would have liked them even more! The idea about using a cracker on top certainly gets bonus points if nothing else. Before I forget to mention it, last week I did get out one of the final treats we will be sending off to Jeff's niece. We've been doing for the past few months as a Treat of the Month for her as a graduation gift. Let's hit up the recap - first was a batch of those Outrageous Oreo Brownies back in September... in October, those Chocolate Malted M&M Cookies went out to her... November's treat brought that Smaller Batch Penuche Fudge... December was that addicting Gingerbread Popcorn. This first month of 2009, we packaged up those decadent Butterfinger Crunch Blondies, followed up by a treat for Valentine's Day in February, those marshmallow fondant-topped Sugar Cookie hearts. March we did those novel Root Beer Float Cookies and this month? 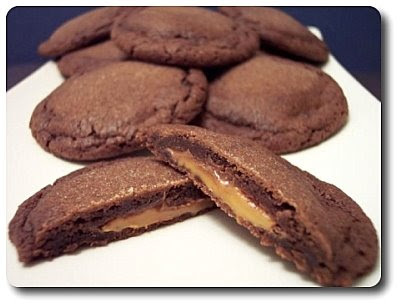 I went to a recipe that we still prepare fairly oven - those Caramel Filled Chocolate Cookies! A basic, but tasty, chocolate cookie wrapped around a sweet hidden caramel center, thanks to those classic Rolo candies! Hard to pass one of these up! What can I say, it was such a beautiful Friday today - with all the windows wide open, we let the warm breeze clean out the staleness of winter in the house! 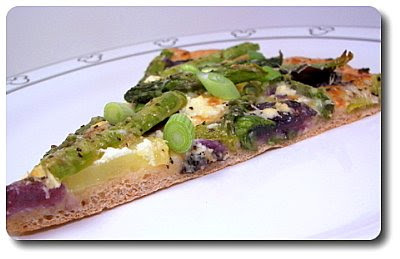 With spring in mind, this Asparagus, Potato and Goat Cheese Pizza I made for our Friday Night Pizza was such a terrific way to bring this lovely day to a close. Listening to the hum of the food processor whirling away, I knew it was only going to be a short minute before our favorite homemade whole-wheat pizza dough had come together. Before I nestled the dough away in its bowl to rise, I gave it a few quick kneads by hand just to make sure it felt right. Since that was ready, I started boiling a few baby potatoes to give them a jump start - I used a combo of purple and Yukon gold. You only need about five ounces of the potatoes, which was literally three small ones - if you happen to have fingerling potatoes, they would be a nice fit here! Allow enough time for them to become tender and then cool down so you can handle them without issue. Right before you roll out the dough, slice the potatoes into thin rounds - they don't need to be paper thin, but you want to make sure you get enough to clutter the top. 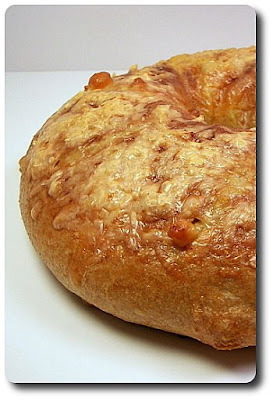 Once the dough was rolled out, we brushed the entire surface with olive oil that we added a minced clove of garlic to. The first ingredient added to the pizza came in the form of thinly sliced green onions - scattering them over the bottom gives them some protection from the intense heat the oven. An ample amount of shredded mozzarella came next, followed by the colorful potatoes and creamy crumbles of goat cheese. Fresh asparagus that we halved length wise, then sliced into pieces, was tossed with a bit of olive oil and arranged over the top. Now, before you add the final ingredient, don't forget to season the asparagus layer with salt and fresh ground black pepper to perk them up! Lastly, one more cheese was added to bring the total to three - we used fresh grated Asiago for its nutty bite, but if you happen to have some sharp Parmesan handy, I wouldn't hesitate to toss that on instead! Since the asparagus was added raw, we didn't pre-bake the crust so it could stand up to the time needed to cook those through. Just as the pizza comes out of the oven, add a smattering of additional fresh green onions on top to freshen it up. While this pizza was quite busy in the ingredient department, they all weaved a cohesive web and made for an explosive combination! Brushing the crust with the garlic oil was such a clever way to work in just a whisper of its pungent note without the worry of it being distracting. Jeff saw the dough covered in tangy goat cheese and made the comment that it looked like too much for this pizza, but he took that back as soon as he took a few bites - he agreed it was actually just right thanks to the weight of the mild potatoes. The pop of color from the purple potatoes and asparagus added to the visual punch, while also keeping it whimsical and unique! There is so much more to the world of pizza than just pepperoni or cheese - don't be afraid to break the mold and go a little crazy! I had to get a head start on tonight's dinner, Asparagus, Leek and Gruyère Quiche, as I wanted to make a homemade crust and it needed a couple stints in the refrigerator before it would be ready to bake. If you haven't gotten your hands dirty and made your own pie crust, it's the perfect time to give it a try! A few tips to help you along - make sure that all your ingredients are cold - the butter, the water and even the flour if you think about it before hand. When you work the butter into the flour, you want it to be distributed throughout and have some lumpy pieces about the size of a pea to ensure that sought-after flakiness. Once you begin to add the water, don't mix it like crazy to get it to come together in a ball - work with it just long enough so the flour looks moistened and if you squeeze a handful of the mixture, it should hold together well. Once it gets to that point, toss the crumbly mass onto your work surface and work it into a disc - stop right then, wrap it well and put it into the refrigerator to give the butter time to firm back up and the flour to finish absorbing the liquid. After we rolled the chilled dough out and fitted it into our pie dish, it needed to once again go back into the refrigerator to get cold again - since this crust isn't pre-baked, this will help the dough keep its shape and not slump down once it hits the heat from the oven. To go on top of that buttery crust, we first placed an ample layer of shredded Gruyère cheese, followed by a cooked and cooled mixture of leeks and thinly sliced asparagus. To round out the quiche, the rest of the filling is a concoction of half-and-half, eggs and a pinch of fresh grated nutmeg for a little zing. The half-and-half adds to the luscious nature of this quiche and since you've already gone and made your own crust, you might as well enjoy the extra calories. However, you could swap that out with milk if you wanted it to be a little lighter. When baking, be sure you set this quiche on lowest rack in your oven so the crust gets the extra fire to cook the bottom through. After it is ready, you'll want to give this at least a 15 minute rest so the egg-y mixture has a chance to firm up before you slide your knife in. 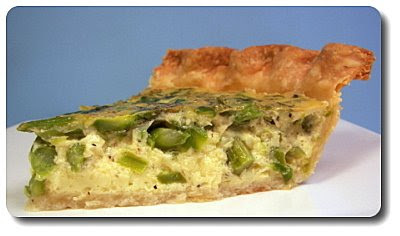 I loved how the Gruyère seemed to not overtake the quiche, but still made itself known with a pleasant nuttiness. 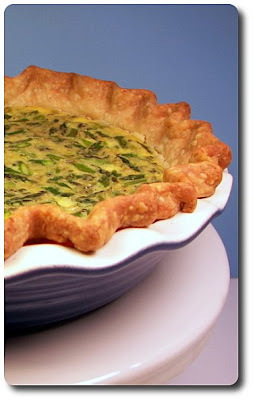 Jeff commented how the freshness of the spring asparagus worked well to cut through the richness of the quiche and after finishing his portion, he was left feeling satisfied without being weighed down. If you know you'd like to make this substantial dish for dinner, but won't have the time to do all the prep work, you could even assemble and bake this off ahead of time if needed. Just slide it back into the oven and rewarm the next day until the center is thoroughly heated through! When we were back in Phoenix, we had planted a couple rosemary plants that flourished and both grew into an impressive sight! However, they don't hold up well to the winters out here, so I'm always anxious to get new ones started about this time of the year. Mom sent us some herbs in pots for my birthday and one of them happened to be a rosemary plant that is taking off inside thanks to a sunny spot by a window! Since it had finally grown a bit, I clipped a few stems off so I could impart its intense fragrance into two dishes we had for dinner. 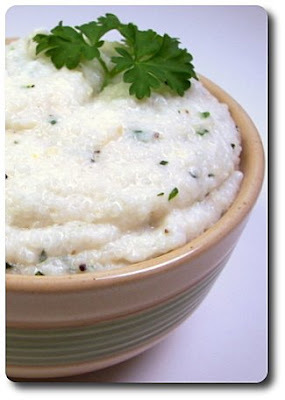 The first way I used the rosemary was in this Goat Cheese Grits dish I made as a side tonight. While the main reason I choose this recipe was to finally finish up the container of quick grits I've had for way too long, I also was attracted by the use of goat cheese! If you happen to have stone-ground grits, by all means use those instead and cook the mixture for 30 to 60 minutes like you would polenta (which means they will have a more developed flavor), but I wouldn't say no to quick grits... especially when you need a side in a hurry. The original recipe did call for using all water to cook the grain in, but we used half vegetable broth to beef up (so to speak!) its pale flavor. It also called for using fresh basil, but as I mentioned, we wanted to incorporate the rosemary, especially since it was going into the main dish as well. Also, don't be skimpy on the salt even though you are using broth - grits need to be almost overly seasoned so it won't get lost in the goat cheese. Once the grits had soaked in the liquid and became thick, we took it off the heat before stirring in the soft cheese, fresh parsley, the rosemary and fresh ground black pepper. If you are off with your timing and this gets done before you are ready to serve it, slap a cover over the top and they should stay fairly loose from the residual heat. Just like polenta, the grits will begin to set up as they cool down and you want these to stay warm and fluid. I would probably add a bit more rosemary (or basil if you are so inclined) next time as the tang in the goat cheese was fairly dominant - however, the grits do tone that down so it wasn't too much and the richness from the cheese made up for a lack of butter. Versatile enough to flavor as you like, we both enjoyed this as it was a nice change of pace from your everyday side dish choices. 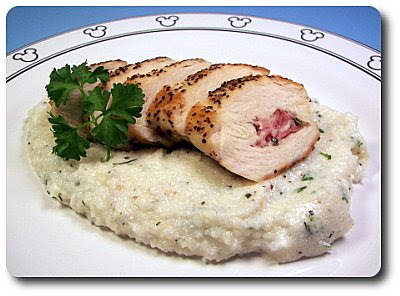 We echoed that tang from the pool of grits into these Herbed Stuffed Chicken Breasts that I made to go along with for dinner. Before I got my hands messy with the chicken, I stirred together soft goat cheese, more of that fresh rosemary and a surprise ingredient for the salt component, finely chopped Canadian bacon! Instead of slicing the chicken breasts in half to stuff them, we simply made a slit in the thickest portion of the breast and used the knife to form a pocket inside. This way, we could stuff the chicken with the creamy filling and not have to worry about trying to keep the chicken together and the filling inside as we cooked them. With a light seasoning of salt and fresh ground black pepper, we heated up our trusty cast-iron skillet and started browning the chicken on one side. Because the chicken was fairly thick and meaty (6 ounce portions), once we turned them over to reveal their rich caramelization, we slid the skillet into the oven and let them finish cooking through from the even heat inside. Once they were done, be sure to give them at least a five minute rest before serving - the cheesy concoction inside will be quite molten and you'll also want to give the juices a chance to redistribute throughout the chicken. Instead of just serving a hunk of chicken breast, we sliced them and neatly arranged the pieces on the plate, letting the secret out of the surprise inside! With goat cheese and fresh rosemary in each, we thought the duo on the plate was a nice way to mirror the two ingredients in different fashions and let them shine. While it tastes like there was a lot of effort used to prepare these moist chicken breasts, this dish is certainly worthy to make when you have guests coming. 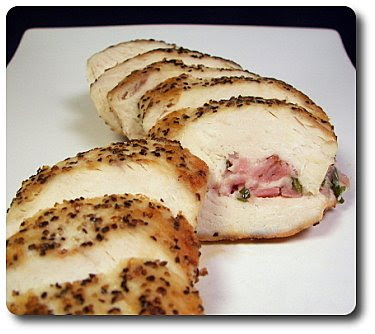 The breasts could even be prepped ahead of time and left in the refrigerator to make for a speedy dinner if you're short on time in the evening. Lots of poppin' was going on today getting the Weekly Wednesday Treat Day ready! 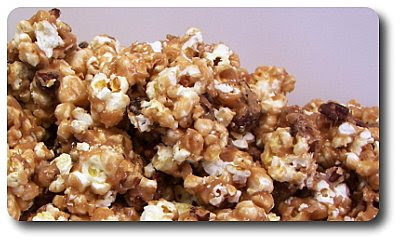 All that noise was because I needed several cups of popcorn for this Maple Popcorn Caramel Crunch recipe I made. Once I got the popcorn ready and threw the airy pieces into a large pan, I toasted a wealth of pecans and scattered them over the top to get the base together. To make the maple-laced caramel we were going to pour over the top, we placed butter, maple syrup, corn syrup and salt into a large skillet and let the heat from the stove slowly bring the ingredients to a bubble. Be sure to place a drink near your burners and either start some music or turn on the TV because you'll be strapped to the pot as this sticky mess needs to be stirred constantly while it boils. You'll also need a candy thermometer, but don't let that scare you away! Dust it off and bring it out as you won't want to pass over this one. Once the sugary caramel has come up to the hard-crack stage, about 300 degrees, we took the pot off the heat and stirred in maple extract to boost the maple notes. If you don't have the extract, I wouldn't fret about having to buy a whole bottle for just this recipe, but I did think it worked in a noticeable difference. Vanilla would probably be fine though. We quickly, but carefully, poured this over the nuts and popcorn - once the last drops fell from the pan, we stuck a couple wooden spoons in to give it a thorough toss, giving each piece contact with the molten mix. 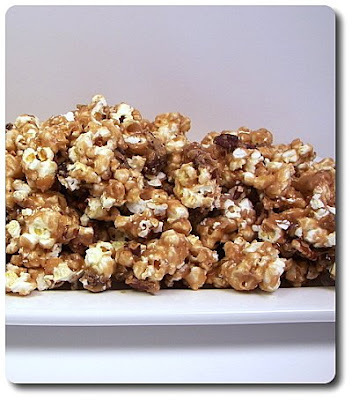 It will probably be fairly clumpy at first, but once it has a chance to cool down so you can handle it, you'll see that the popcorn can be broken into bite-size nuggets. While we've had regular caramel popcorn before, working maple syrup into the mix was a first for me and will definitely not be the last! It is quite sweet, but using the recommended amount of salt will help cut that down to a reasonable level. 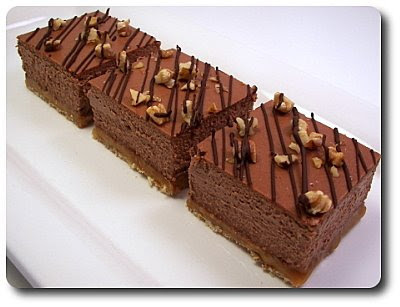 Quite crunchy, nice and nutty with alluring mapleness in each bite, I can see us making this often, either to fill up cellophane bags for bake sales, to give away as treats for friends or even just to satisfy a wicked sweet tooth! *No pictures for the dinner tonight - the camera is being fussy and not wanting to transfer them! I'll keep working on it - sorry! When I was going over the recipe for dinner tonight, Ham-and-Egg Fried Rice, something about the ingredient list looked a bit odd. It called for "1 1/4 cups cooked rice" - but, for 4 servings, that seems pretty skimpy if you ask me... it is a fried rice after all! I just assumed they meant to say 1 1/4 cups rice, cooked, and that is what I ended up doing. It did call for the rice to be a white variety, but you are more likely to find brown basmati in our pantry and I used that. I cooked the rice last night using our favorite no-fuss method so the rice had time to chill and dry out in the refrigerator before I went to use it. Cold rice works best (especially day old) as the grains will firm up and separate easier - if you use freshly cooked rice that is still warm, the results will be much softer and almost mushy. However, I am far from an expert on fried rice, but this has just been my experience! If you don't have leftover rice or forgot to prepare it the day before, try and give it at least a couple hours resting time. Before the rice went into the skillet, we heated strips of ham, the whites from a bunch of scallions, fresh ginger and a few cloves of garlic. Once the ham had started to gain a bit of color, we tossed in the cold rice, the greens from the above scallions along with equal parts rice vinegar and soy sauce. After flipping the mix around and completely heating it through, we scooped out the rice into the serving bowls, wiped out the skillet and added a drizzle more of canola oil. What came next? Four eggs! However, instead of scrambling them first or with the rice, we gently slid them into the skillet and let them fry until the whites were set, yet the golden yolk was still quite soft and fluid. You could, of course, cook the eggs to whatever degree your heart desires, but leaving them softer and letting the yolk ooze its richness over the rice after poking the egg was truly a delicious experience. It did seem a bit heavier than other types of fried rice we have done, but we didn't find that unappealing at all. I wasn't sure how well the ham was going to dance with the rest of the ingredients, but it went surprisingly smooth and not out of place! Yesterday we packed up Gus and drove down to the farm to visit with family over Easter. 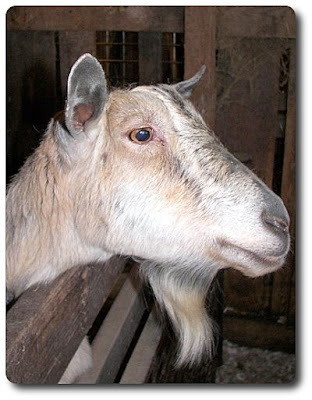 Gus has been down to the farm a couple of times, but it had always been too cold outside to take him around and show him the ropes. We decided goats would be a good start for this trip - I wonder what was going through his head when this scruffy guy popped up to see what all the fuss was? 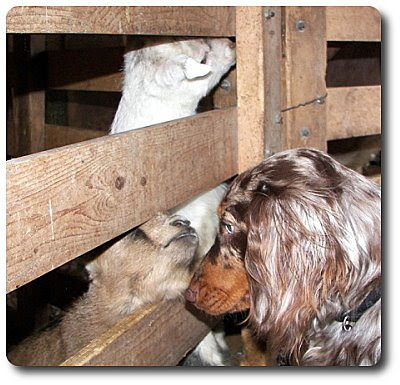 We then brought him down to the kids in the barn that were closer to his size... they just wanted to give him a little kiss! Then we went to check out the bigger guys that were outside... who were at the ready! I figured he might just run away and hide, but he had the guts to stick his little head right to the fence and sniff things out! I think he might have to be renamed Mighty Gus if we can find a cape his size! Mom was taking care of most of the spread for dinner, but we did contribute with dessert (surprise!). 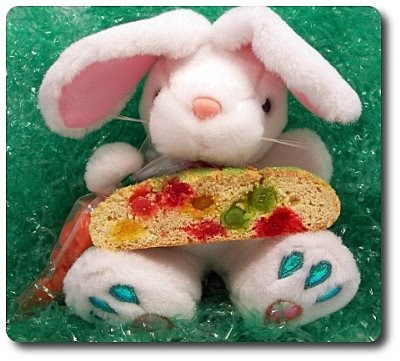 Since Jeff always makes sure that I bake a batch of those jelly bean studded Easter Biscotti each year, I did bring a few down to share. I also thought some cupcakes would be good and I made those White Cupcakes we made for treat day a few weeks ago. 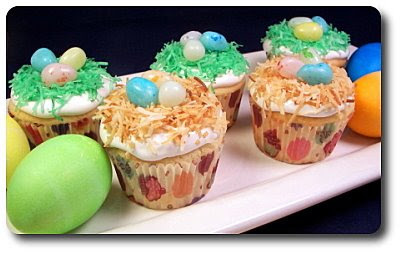 Instead of doing a traditional buttercream, we went with a soft and creamy marshmallow frosting and topped each cupcake with either green-tinted or toasted coconut to work as a nest for some candy speckled eggs! I'll try and get that posted in couple days if anyone wants that frosting recipe.